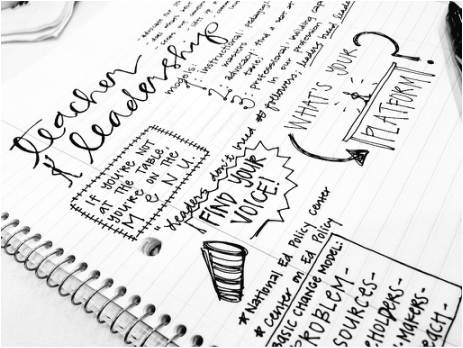 Several themes will remain at the forefront of my mind when it comes to leadership style and effectiveness after analyzing and reflecting on leadership in the teaching profession. The first is that leadership, of any kind, is a continuum. The main point here is that good leadership does not have to be, and often is not, positional. The title of “leader” does not guarantee the skills or characteristics that a good leader should have. As I have considered the different forms leadership can take, it is clear to me that while one is almost always leading it may be in various ways other than positional. As I observe the leaders around me more and more I find that those with personal power and quiet leadership are usually the most effective. People with personal power tend to gain it with traits like accessibility, approachability, competence and integrity; these people generally “assume that all participants [in the school] are equal and contribute value through their participation” (Katzenmeyer & Moller, 2009). Others naturally attribute power to someone with this attitude and these attributes. Regardless of the kind of leadership one chooses or is able to display, every teacher has accrued during his or her career a “massive collection of experiences and learnings” that are of great value, particularly when unified across multiple people (Barth, 2001). This craft knowledge, as Barth coins the term, can guide teachers at all levels in an “intentional analysis of practice” (Barth, 2001). The person sharing craft knowledge does not have to be in a position of power, and in fact many times is not. It has been eye-opening for me to realize how much power I have, even (or especially) as a classroom teacher. There are so many ways in which a strong teacher leader can effect change, but action research is one of the most impressive. Everything teachers do in the classroom is data for something (MacLean and Mohr, 1999). So often teachers wait for researchers and policy makers to hand down the data about best practices in education, when in fact classroom teachers are in a very good position to be conducting the research themselves. The catalyst initiating any research process is discomfort with what one feels to be an unproductive approach to teaching, often encountered in personal experience. One of the most important facets of teacher research is that the one conducting research is also a participant in the process, not a detached observer (Duganzic, et. al., 2009). This may be the greatest benefit of all in the action research process because so often those conducting research or implementing change in a education system are so far removed from the reality of the classroom experience (and how it may have changed) that their ideas are less helpful and less practical. Koshy touts the practicality of this kind of research in her handbook for action researchers, calling it "living knowledge" and stating that "the purpose of action research is to produce practical knowledge that is useful to people in the everyday conduct of their lives" (2010). These practical outcomes are what make the research worthwhile. The most helpful and effective strategies I have implemented in my classroom have been a result of my own reflection and that of my colleagues who are experiencing similar struggles or successes. Considering how biliteracy might be used to close the achievement gap between native Spanish speaking students and their English speaking counterparts, I felt empowered to use my action research project to target one aspect or strategy of biliteracy instruction. I wondered how I could improve Latino students’ reading comprehension by making linguistic connections between English and Spanish vocabulary, as I was consistently seeing a larger percentage of my Latino students struggle with reading comprehension, even though literacy instruction is in Spanish. "The bridge into the other language doubles the concepts students attain in literacy and content academic vocabulary and fosters literacy in both languages." The emerging research I used to support my study supported fostering a biliterate environment for these students based on the belief that more explicit connections between the languages would deepen linguistic understanding in both. With this theory in mind, I wanted to begin building my Latino students’ English literary skills and explicitly teaching them the connections between the languages. The lessons “bridging” between the languages focused on one of four linguistic connections: phonology (sound system), morphology (word formation), syntax & grammar, or pragmatics (language use), as explained by Karen Beeman's Biliteracy Framework (2012). Beeman outlines the need for a bridge activity designed to explicitly point out connections between languages to students and focus on the main content and literary vocabulary of the unit. The bridge into the other language doubles the concepts students attain in literacy and content academic vocabulary and fosters literacy in both languages (2012). My research involved teaching students the linguistic connections between English and Spanish vocabulary during guided reading groups with my Latino students, and then presenting the information again to the whole class as part of the mini lesson during science/social studies. This model allowed the students who needed these connections the most to have twice as much exposure to the linguistic concept. For example, my first lesson focused on the critical content vocabulary for our unit on Earth materials. Some of the words included rock/roca, Earth/tierra, soil/suelo, clay/barro, resources/recursos, tool/herramienta. Based on the literature by Beeman I chose to focus on grammar for a contrastive analysis between the languages in each of these vocabulary words. With a grammar focus on word gender, I pointed out that for each word in English we use “the” (rock, soil) while in Spanish we use “el” and “la” depending on the gender of the word (la roca, el suelo). I taught lessons like this one whole group as well as reviewing the concept in a small guided reading group with my Latino students for continued exposure. The full research report is below. 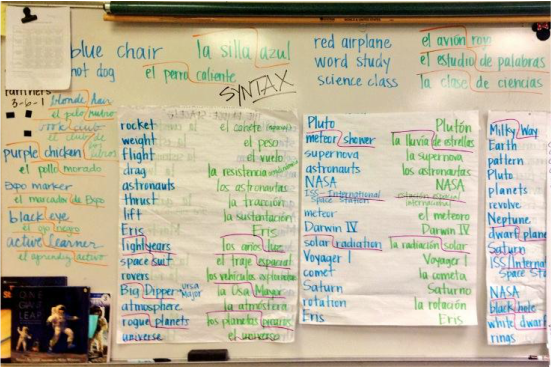 Anchor charts from a bridging lesson with a syntactic focus in a third grade classroom studying outer space. As I continued my research I found many studies about biliteracy and its benefits that lay the foundation for the reasoning behind introducing connections between the languages as a helpful strategy for students. Many publications and researchers have studied the need for biliteracy and other ELL strategies. One such researcher, Maria de la Luz Reyes, from the University of Colorado-Bouler seeks to “dispel the myth” that fostering bilingualism leads to weaker or slower English language acquisition. She claims that native Spanish speaking students will develop literacy skills in Spanish even if they never receive Spanish literacy instruction and that these skills should be leveraged to support English literacy skills. She notes that this process can also occur in reverse (a native Spanish speaker with no English literacy instruction can develop spontaneous biliteracy by transferring skills learned in the native language to English texts). Due to the natural development of spontaneous biliteracy, her main purport is to encourage educators to view biliteracy and what she calls translanguaging and transliteracy as supports to learning rather than hindrances (2012). There is a growing base of research that supports fostering a biliterate environment for emerging bilingual students based on the belief that more explicit connections between the languages will deepen linguistic understanding in both (Arteagoitia, 2013; Beeman, 2012; de la Luz Reyes, 2012; Dressler et. al., 2011; Jimenez et. al., 1996; Nagy et. al., 1993). Barth, R. (2001). Learning by Heart [Kindle version]. Retrieved from Amazon.com. Bolos, N. (2012). Successful Strategies for Teaching Reading to Middle Grades English Language Learners. Middle school journal, 44 (2), 14-20. Dressler, C., Carlo, M. S., Snow, C. E., August, D. & White, C. E. (2011). Spanish- Speaking Students’ Use of Cognate Knowledge to Infer the Meaning of English Words. Bilingualism: Language and Cognition, 14(2), 243-255. Duganzic, J., Durrant, T., Finau, L., Firth, N., Frank, M. (2009, November 7). Action Research in the Classroom Part 1. Podcast retrieved from http://www.youtube.com/watch?v=MDVH0u4tUWo. Duganzic, J., Durrant, T., Finau, L., Firth, N., Frank, M. (2009, November 7). Action Research in the Classroom Part 2. Podcast retrieved from http://www.youtube.com/watch?v=MDVH0u4tUWo. Jimenez, R. T., Garcia, G. E. & Pearson, P. D. (1996). The Reading Strategies of Bilingual Latina/o Students Who Are Successful English Readers: Opportunities and Obstacles. Reading Research Quarterly, 31(1), 90-112. Katzenmeyer, M. & Moller, G. (2009). Awakening the Sleeping Giant: Helping Teachers Develop as Leaders (3rd ed.) [Kindle version]. Retrieved from Amazon.com. Koshy, V. (2010). Action Research for Improving Educational Practice (2nd ed.) [Kindle version]. Retrieved from Amazon.com. Nagy, W., Berninger, V., Abbott, R., Vaughan, K. & Vermeulen, K. (2003). Relationship of Morphology and Other Language Skills to Literacy Skills in At-Risk Second-Grade Readers at At-Risk Fourth-Grade Writers. Journal of Educational Psychology, 95(4), 730-742. Left: Stewart, A. (2015, March 14). Teacher Leadership [photograph]. Retrieved March 15, 2015 from https://twitter.com/allisunrae/media. Right: Stewart, A. (2014, November 17). Bridging Languages [photograph]. Retrieved March 15, 2015 from https://twitter.com/allisunrae/media.